Toys, toys EVERYWHERE and not a spot too clean. That's how I'm feeling these days. Like I'm slowly being engulfed in a quicksand of plastic. So much so that my normally infinitely patient self (ha! ), the me who never loses her temper with her always-a-lego-in-hand children, may have at one point in the last week lost said temper with said plastic and said some choice words in the process. My out-of-body (read: going out of my mind) Not me! confrontation with the steadily multiplying piles of crap, I mean, supply of fun of the 250-pieces or more, lots of assembly required variety came to a crescendo this weekend. It came as I did not tell my four year old for the fifth time to get his sh*# off the stairs before I threw it away. Not me! "What ship, mom? My ship is already in my room," he replied. Ughhh. Laugh to myself. Thank God for innocence and forgiveness and moments like these. "What I meant to say is please sail all these toys like a ship up to your room before I have to throw them away." Lose my temper? Swear like a sailor straight into the innocent ears of my sweet boys? Get schooled in the moment by a child infinitely wiser than I am? No, not me! Summer is heating up and we're doing our best to take advantage of every tube-free minute we've been given. Just 48 hours after we waved good-bye to those lousy green tanks we had the family car packed and on the road. We were seeking crisper, cleaner air and a change of scenery in a few of Utah's many giant-sized playgrounds. Our first stop was the sleepy little town of Marysvale. It's a back country, ATV-lovers paradise. 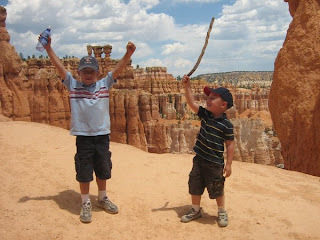 All we knew is that it was about three-quarters of the distance to Bryce Canyon and featured several mom-and-pop-type outcroppings of log cabins where the boys could play wild west for the night. It was hometown, friendly and is now permanently on the list of things to do in years to come. In fact, we so enjoyed the look of the mountains that surrounded our outpost that we decided to rent a family-size ATV and head for the hills. (Yes--we were getting in touch with our inner redneck and loving it!) We saw an abandoned mine town. A waterfall. More butterflies than you could count. And breathtaking views in every direction. 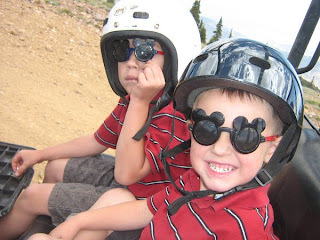 The boys donned crash helmets and McKay didn't know what to make of the open air ride. 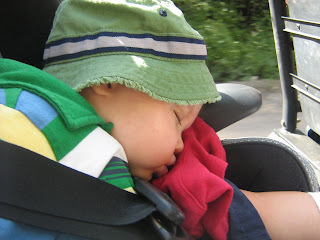 He licked the air, he laughed, and then he promptly succumbed to the loud, but steady hum of the engine--and napped! Too funny. 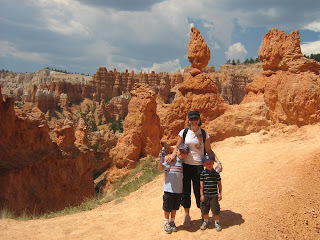 Covered in dirt and smiles from head to toe, we piled back into our favorite people mover and headed to our destination: Bryce Canyon. This place never disappoints. It is stunning. Every time. When we started planning this trip a couple of months ago it began with a race. I had no idea the Canyon offered an annual half marathon. After learning that one of my favorite destinations played host to one of my favorite pastimes--I had to be part of it. The only hang up was whether or not we were brave enough to take on three little bodies sleeping in the same hotel room. We were concerned with finding a hotel that wouldn't make us crawl at the thought of McKay on its carpets. It just so happened that a new hotel near the Park entrance was slated to open its doors shortly before the race. We made our reservations and relished in the new paint smell and fresh furniture upon our arrival. PERFECT. 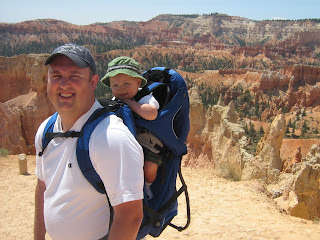 We bought a great backpack for hauling our little butterball up and down Bryce's famed amphitheater. He loved it. 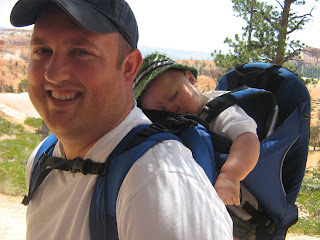 And once again, took Matt's steady pace and the peaceful scenery as an opportune time to catch a few zzzz's. 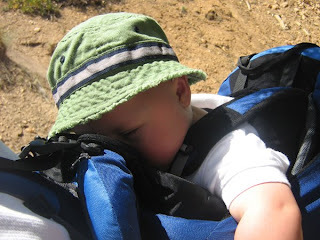 The site of a sleeping baby seemed to draw more attention from the multitude of European tourists there than the canyon itself. 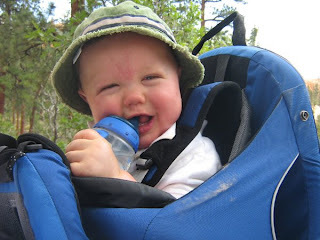 Do people not take babies on vacation in other countries? Whatever. 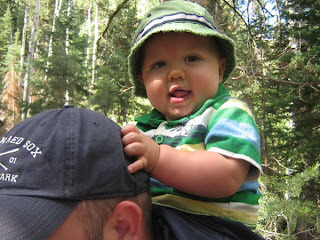 The boys were troopers and made their way through three miles of strenuous and steep trail like champs. It was HOT. Honestly, they were impressive. I am so lucky to have this crew. 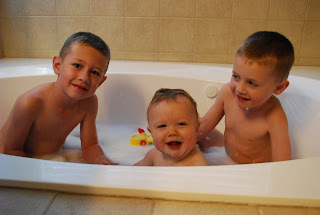 In any event, we're home and showered and ready to plan our next adventure. I've been looked at a little sideways from some for being so "normal" in our routine with McKay. The store. Vacations. Church. I've thought a lot about this comment, this criticism. My only answer is this--how else should we be? This is our normal. Everything we've been through in the past year was designed to get us here. Here to playing and wrestling with his brothers. Here to road trips. Here to hiking and enjoying the outdoors. Here to swimming and swinging and the zoo. Here to living. 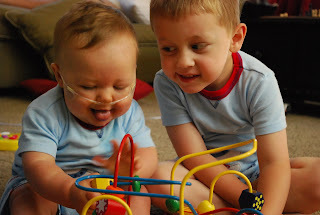 No matter what's ahead, no matter how much time God is willing to give us with McKay (we're voting for a ridiculously long lifetime thank you very much), we have been trusted to assure he lives--and we take that assignment seriously. Not just the breathing in and out part, but the really living and enjoying and laughing and experiencing parts. Because that's the stuff that makes life worth living, the stuff that energizes our souls and makes us stronger. And praise be that right now he is able and healthy enough to do it all. Besides, all it takes is one look at him--without the tanks and tubes--and you must admit, you would really never know. So shhh, it's our little secret and we'll agree to let the kid be a kid. 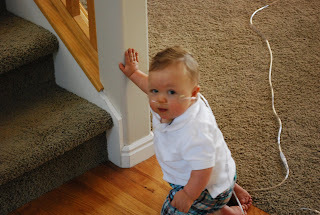 We just raced home from a quick stop in to the cardiologist and it seems McKay's carefully-placed new coil is doing the trick. He posted oxygen saturation readings between 78 and 82 this morning...YAHOO!! I couldn't help but whoop and holler right in the exam room. Those numbers are as good as McKay has ever recorded. That means no more tubes, cords, or tanks for now. Hallelujah. Praise be. Can I get an Amen?! We are truly so relieved, grateful and giddy we just had to share the good news! Thank you so much for all the prayers. 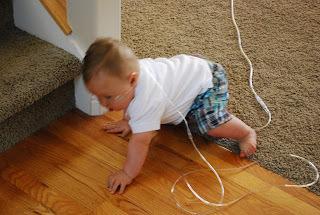 As I type I am watching McKay crawl as fast as he can straight for me--a feat that normally would have been circumvented midway by his leash of a cord. No more! It's a joy to watch him be free--a joy that is simple, pure and soon to become a true challenge as we try to save him from his new daredevil self. We say: Bring it on! xoxo. 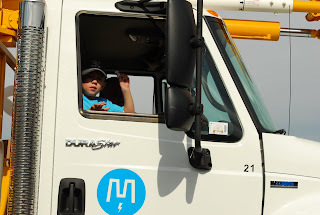 Outsourcing: (verb) to obtain goods or services from an outside source. An act that signals an important state of self-awareness and surrender; often a means of survival for mothers of small children. I am a very patient person. Start a project without reading the instructions first? Abandon an over-ambitious endeavor (or 12) midstream so I can store it and trip over it and feel guilty about it for years to come? Not me! I set aside infinite amounts of time to craft, tinker and otherwise encourage my creative juices. I would never cry uncle and begin to let go of the control I so firmly enjoy in the name of convenience. Not me! So when I looked at my calendar on a particularly packed Saturday and realized I had a 16-mile training run, Matt's work picnic, the Intermountain Healing Hearts (IHH) family dinner, and a REAL soccer game all scheduled for the same day, I did not panic. Anyone can plan ahead for days like that, right? 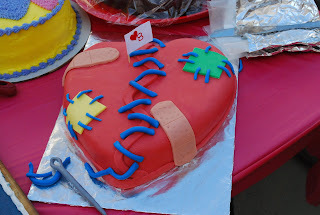 I most certainly did not pick up the phone and call the world's most gifted cake maker (my infinitely creative and talented sister-in-law) to have her create this for my entry into the heart-shaped dessert contest at the IHH picnic. Not me! I will most certainly be able to look at every member of this unbelievably special group of families in the eyes again and without batting an eye say, "Yes, that's me. The one who brought the fabulous heart cake. You know, the one that won for Most Creative." Not me! I think they'll forgive me. (Most of them anyway.) Afterall, outsourcing the cake was an act of survival and sanity that weekend--something they all know far too much about. 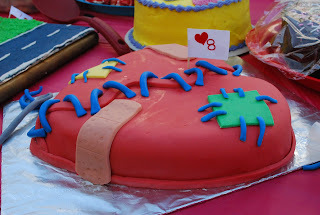 So to all our wonderful heart friends, just remember that when you see a fabulous cake at the picnic next year, you'll know it was definitely Not me! 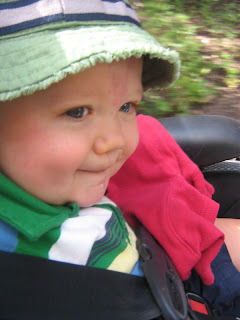 Call us fair weather bloggers if you must, but life has changed just a bit in the past week and that little change has disrupted the regular flow of our daily routine. What is the change you ask? Mr. Mac is on the move. Crawling. Reaching. Falling. 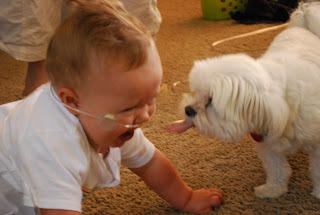 And, after a few kisses (from my sister's dog and other cheering onlookers) and someone to set him upright, he starts the process over and over and over again. Hooray for Physical Therapy! 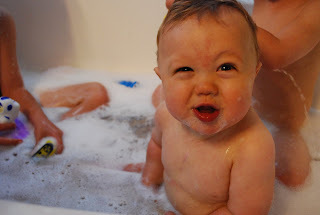 He is determined, strong and oh-so-very-proud of himself. McKay's new mobile universe has taken over the house and a great deal of my free time. Prized toys are being placed just a bit higher up on the shelf, doors are being closed in an effort to keep the little bug from bugging too much, and cries of "Mo-om! He's touching my stuff" rule the day. LOVE it! 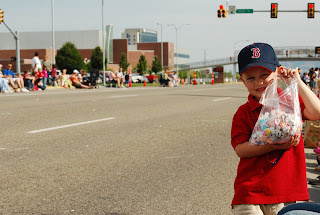 Preston collected an nauseatingly-huge stash of asphalt-warmed taffy at the parade (and grass and rocks and dirt--When else is it okay, even encouraged, to forage for food on the street??). 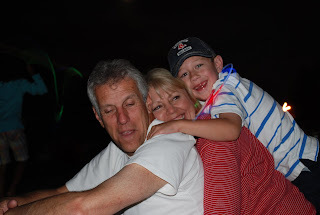 While Ty took his role in the parade as Grandpa's taffy-throwing wing man very seriously. Practically punch-drunk with sleeplessness and sugar, the boys had as much fun waiting for the fireworks to start as they did watching the show. Ty squished poor Grandma Di until she giggled like a third grader. McKay had fashion on his mind as he wore almost every piece of red, white and blue clothing in his closet at once. 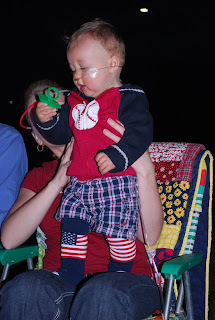 We especially loved the way his new patriotic Baby Legs fit right under the plaid shorts. I know--stellar. Life is good. The boys are busy with all the things that make summer summer and childhood childhood. Swimming lessons. Summer camps. The zoo. Time is passing far too quickly and I get panicked every time they outgrow another article of clothing that this special time is slipping away from us. Truly the most rewarding part of all the the work and busyness that is our life these days is watching our sons grow closer to each other. I want more than anything to teach them to rely on each other, feel grateful for each other, seek out their brothers' company and establish each other as their best friends for the decades to come. That is what motivates us to provide the experiences that create together time. There are not a lot of frills or fancy in those moments this year-- no exotic locations, no plane trips, or big souvenirs. This year it's mostly just the "together" that makes the destination great. And yet somehow I think this might be one of our most memorable summers ever. It seems just a bit sunnier this year. Who knew?